Today’s post kicks off a new category for our blog, Food and Nutrition. After witnessing some of your eating habits at the last tournament, I feel compelled step in and offer some advice and suggestions on foods and snacks to help keep your energy up for a tournament without weighing you down. After all, by becoming a member of our club and making a commitment to learn and train in fencing, you are an athlete. It’s important that you fuel your body to peak physically and mentally. 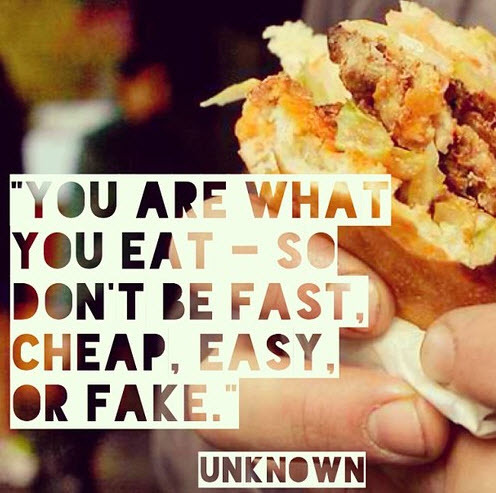 You are a product of whatever you put in your mouth. You eat like crap, you feel like crap and you certainly cannot perform at your very best, which likely means you perform like crap. If it had a mother or grew in the ground, you are probably in good shape. Anything that never spoils is a bad idea. Read labels – 5 recognizable ingredients or less is the rule. Even ‘healthy’ products can fail these rules, so educate yourself. As you continue to eat clean food, you lose the taste for excess fat, salt and sugar. Your body does not want this stuff, but it’s gotten used to it. Once you’ve broken the cycle, you’ll find that when you taste those things again, you’ll think they are too salty, sweet or greasy. As some of you have learned by now, your performance in fencing is entirely up to you. How well you do on the strip depends on no one else but you, so make the best choices both on and off the strip to make sure you can perform at your best. Additionally, a well-balanced, nutritious diet can help you keep physically fit and mentally alert not only during and after fencing season but all year round. Look for the next article in Food and Nutrition where Toni will offer some suggestions on how we, as a team, can work together to keep properly fueled for our next tournament. This entry was posted in Food and Nutrition and tagged competitive fencing, healthy snacks, physical activity, recreational fencing on January 22, 2014 by A.B. Schafer.